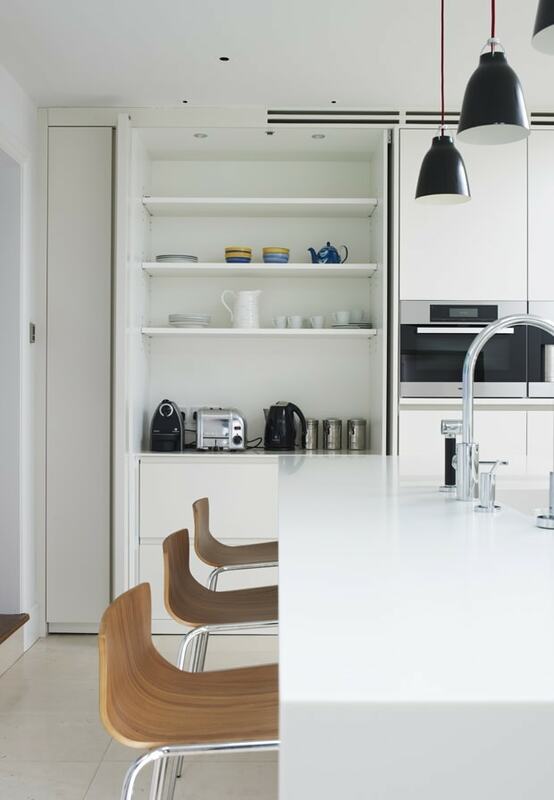 We were commissioned to design a bespoke kitchen and dining space in this West London house that would recreate a similar aesthetic to the family’s West Wittering beach-front holiday home. 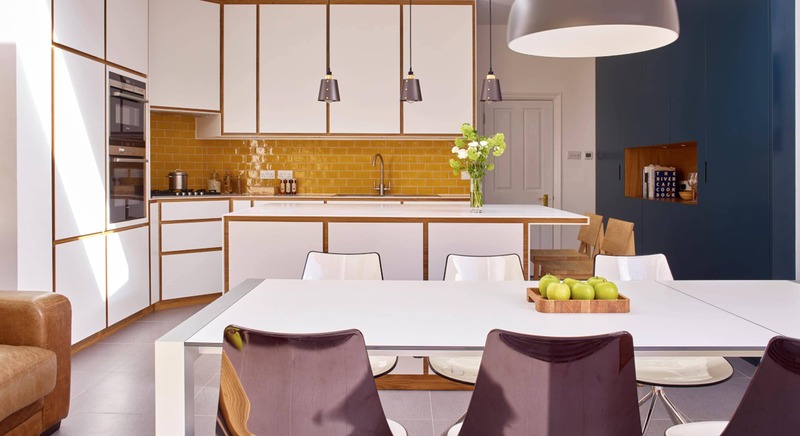 The home belongs to a creative couple with two teenage sons who didn’t want the finished look of their kitchen to be too uniform or new, so we had to consider which materials would allow for the warmth and character they hoped for. Cooking and entertaining are important aspect’s of our client’s family life, so we wanted to create a space that would allow for sufficient food preparation and seating. With this in mind, Robert designed the central island which uses powdered lava and water to give the look of poured concrete. The combination of shaker style cabinets, painted pine boards and exposed brick walls create a beach-front atmosphere to complement the unpolished finish of the island. 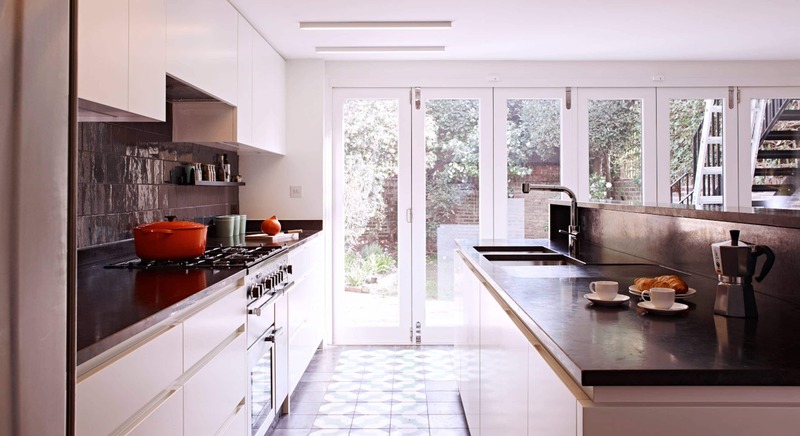 The kitchen was moved to the front of this Notting Hill family home using the joinery to form the elegant entrance hallway. 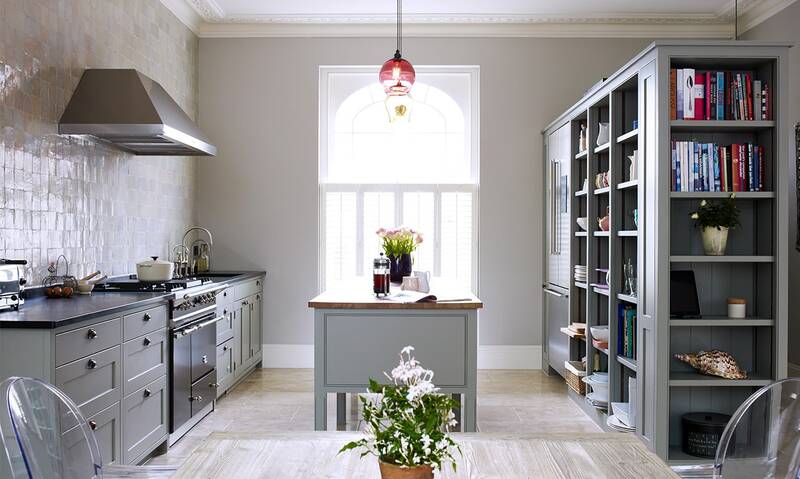 This open plan light and airy kitchen and dining room has a limestone floor. The cabinets are made of tulip wood and oak and are hand painted. 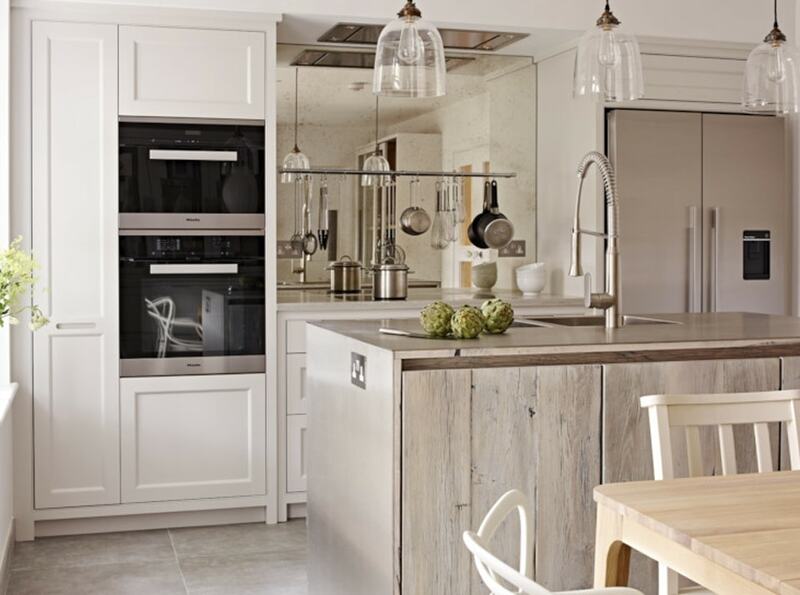 This kitchen island has tall legs for a light and free standing feel and is finished with an oak worktop. 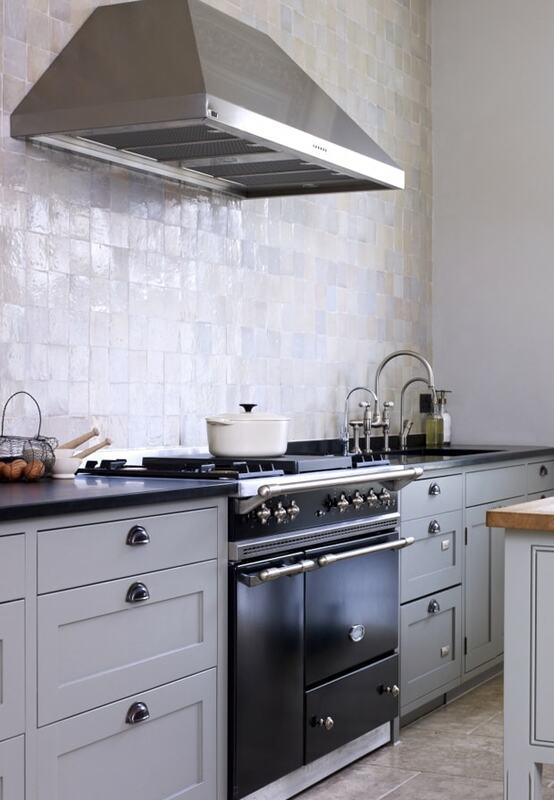 A slate worktop has been used to complement the black Lacanche range cooker, and hand-made wall tiles from Emery & Cie complete the look. 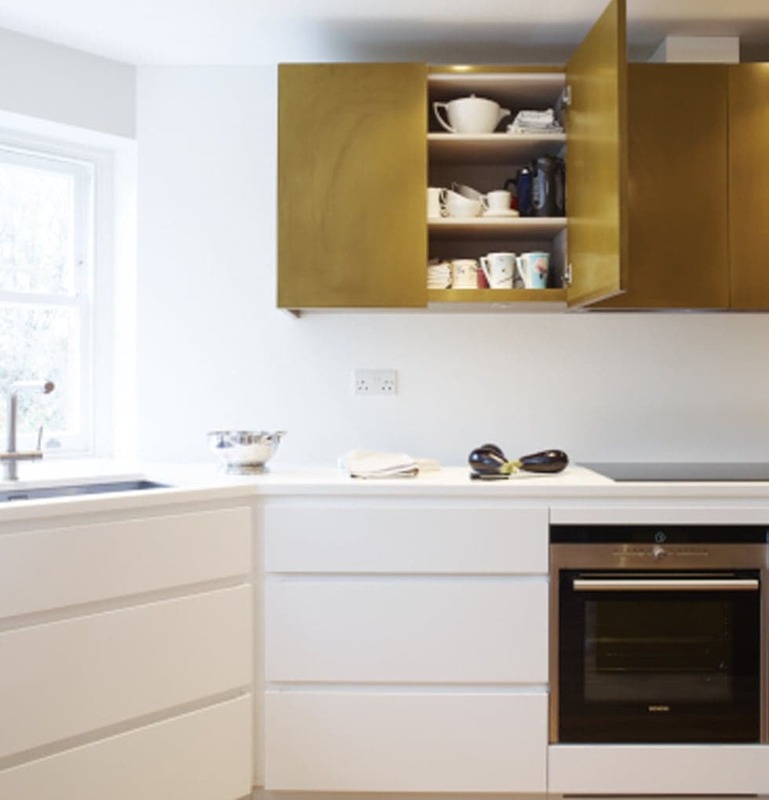 The open shelving unit allows the client to add colour and personality to the kitchen through their accessories, as well as adding to the character and individuality of the kitchen. Open shelving to add personality. Free standing island to create a spacious feeling. 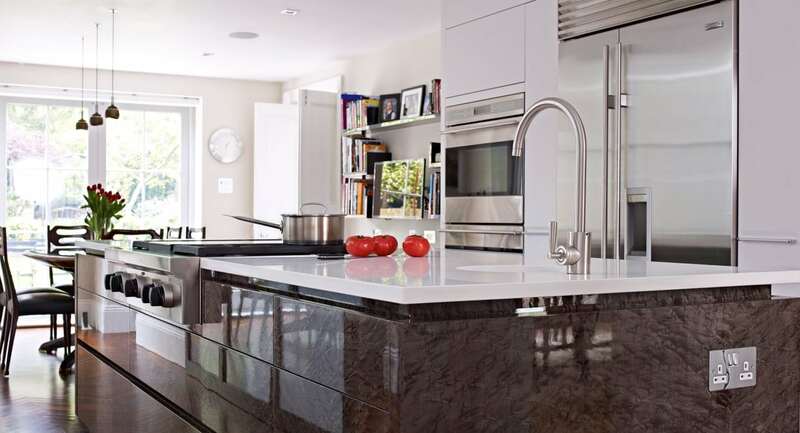 A total remodel of space creates a sophisticated kitchen. 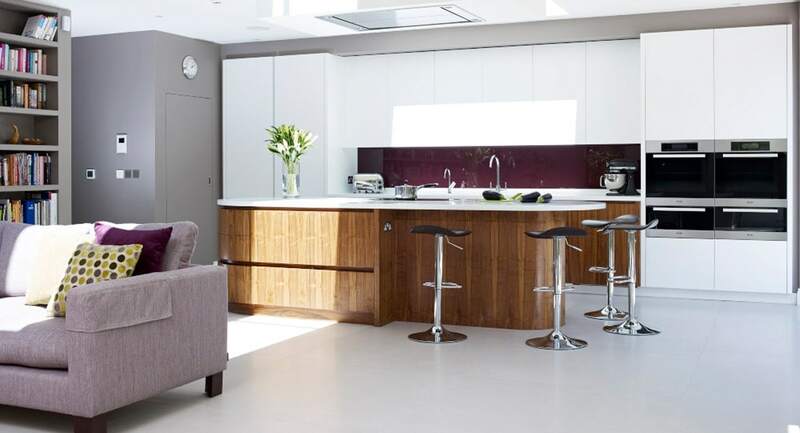 The owners of this 5 bedroom detached home in Hampstead wanted to open up their ground floor for a new kitchen, dining room and living area so that they and their 2 teenage children could spend time together. Our brief was to create a stylish and sophisticated scheme but before this could happen various architectural changes needed to be made. 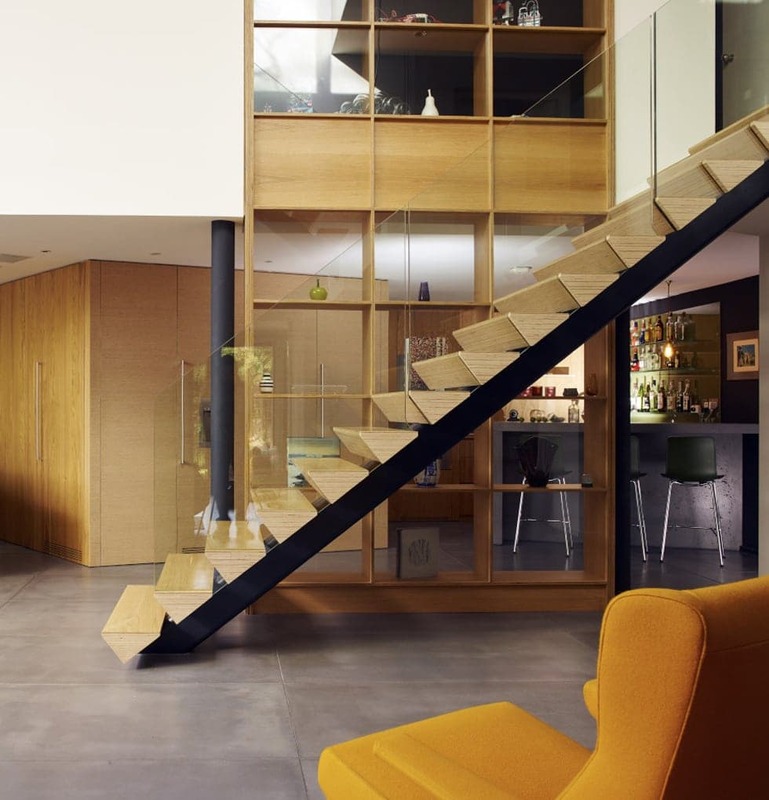 In order to create the perfect space we removed walls, removed a utility room and a stair case as well as levelling the floors and ceiling throughout so that the space looked like it had always intended to be this way. 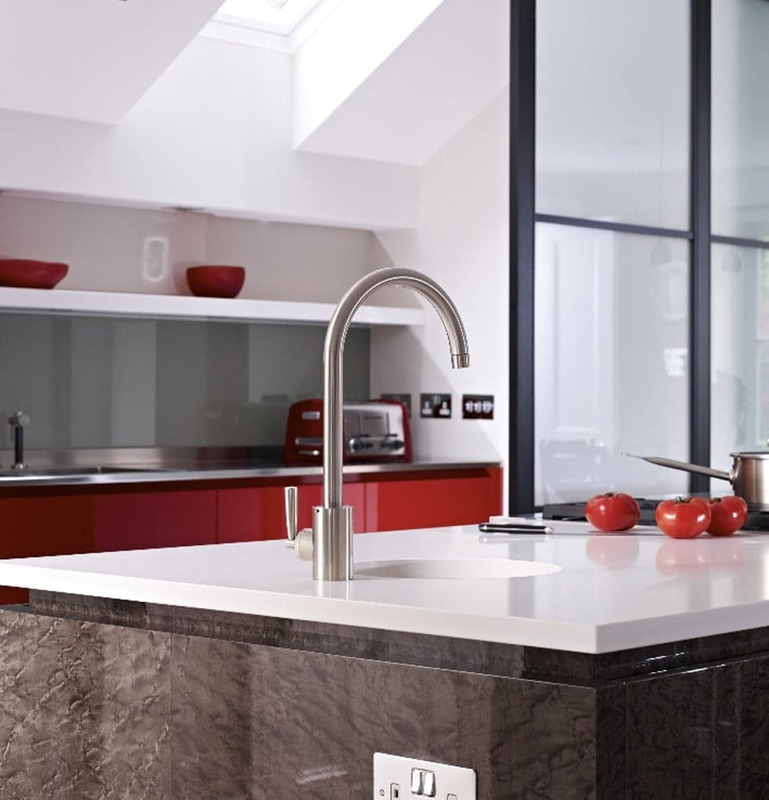 The kitchen design has a modern twist on the more traditional shaker style kitchen by designing a flat bespoke handle detail. The cabinet interiors are made of dark stained oak to contrast with the light coloured cabinets painted in Farrow and Ball London Stone. 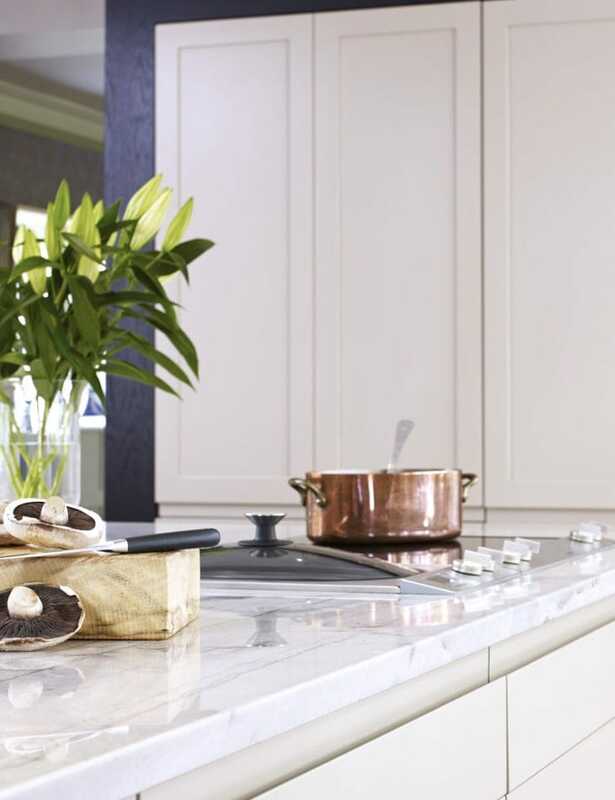 The worktop is a marble effect white Macaubas quartz which shows off the contrast of the light colour with the dark veins. 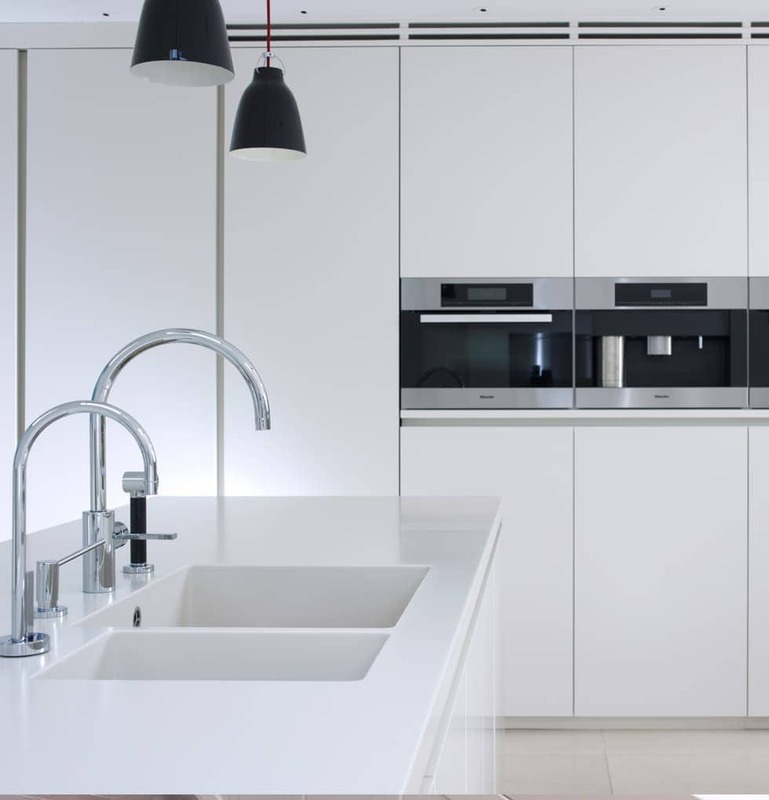 The kitchen is equipped with a Gaggenau combi microwave oven, single over, warming drawer, induction hob, steamer, fridge freezer and fully integrate dishwasher. 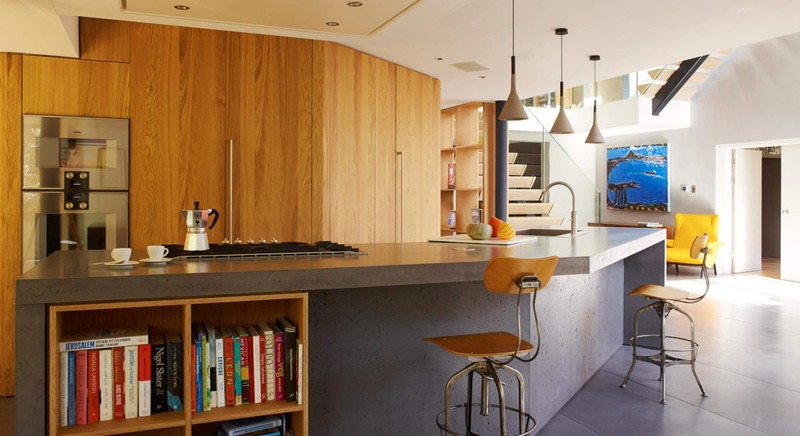 The design uses tall cabinetry to separate the kitchen and dining area and the joinery flows through into the living area to help link the areas as one. 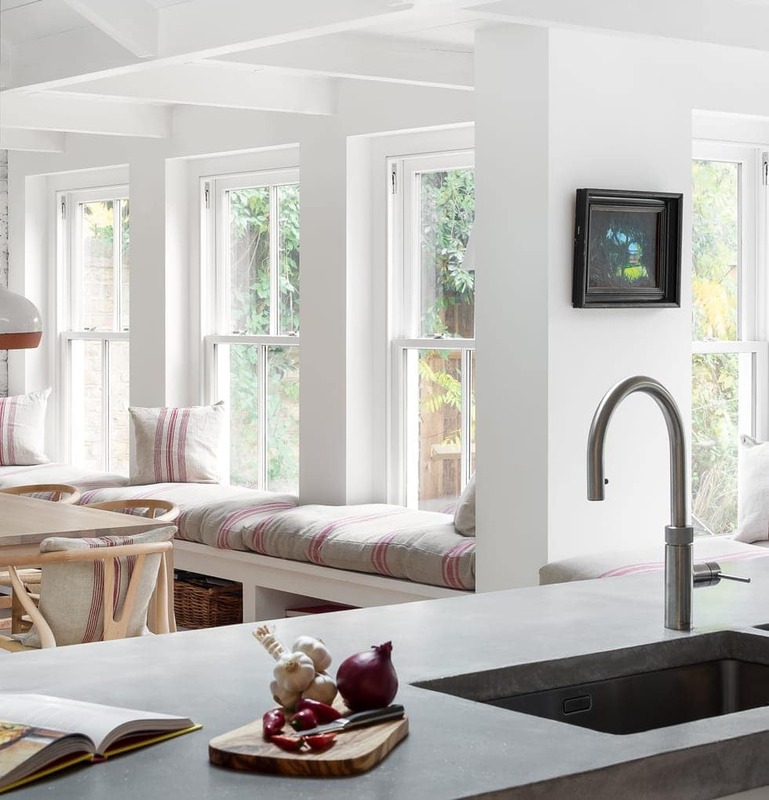 The space is finished with a beautiful oak herring bone floor and bespoke seating that compliment the original crital steel windows and have added to the warmth and character of the house. Reclaimed Belgium Oak works with contemporary white cabinets. 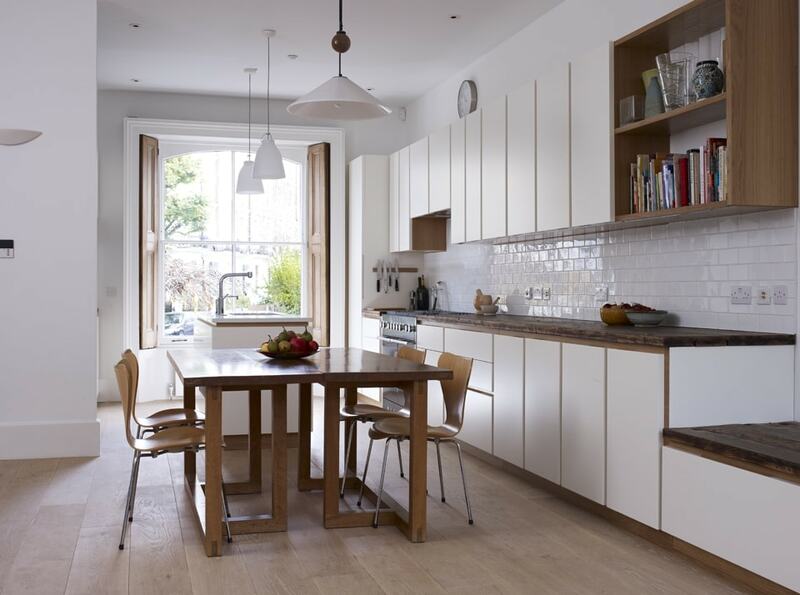 When the clients bought this four bedroom house in Notting Hill the kitchen was narrow and cramped and there was a separate dining room. The brief was to open up the space and to let the light flood through from the large main window. The clients had an existing black Mercury cooker that we were to incorporate as a feature into the new kitchen design and they wanted the worktop to compliment it. 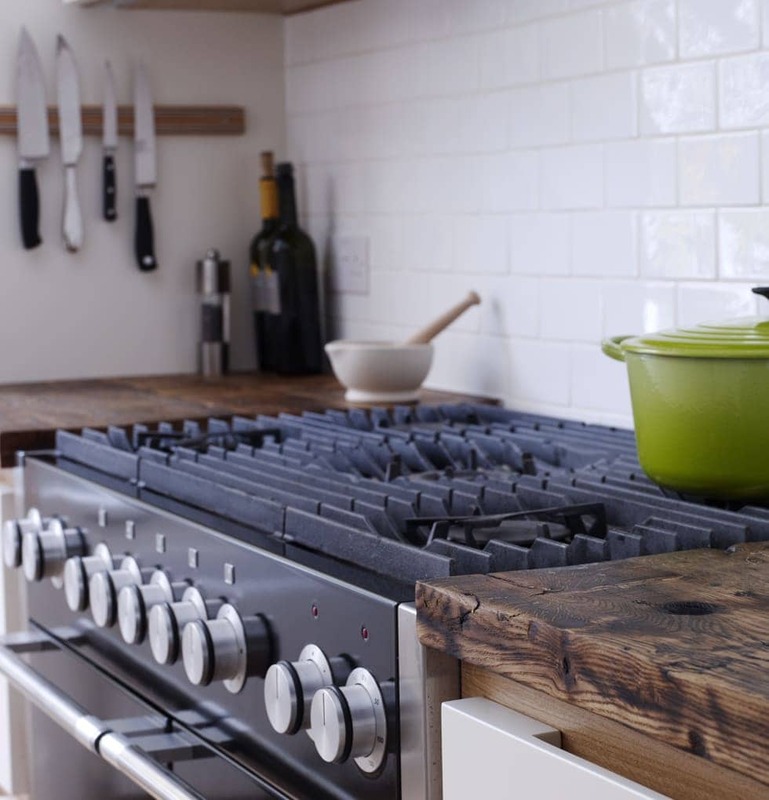 The warmth and character of the reclaimed Belgium Oak worktops contrasts beautifully with the simple white contemporary cabinets and the period of the house. The Bianco splashback tiles complete the feature. The room was not wide enough for a large island with seating, so we created a slim island with a hard wearing Ceasarstone worktop. 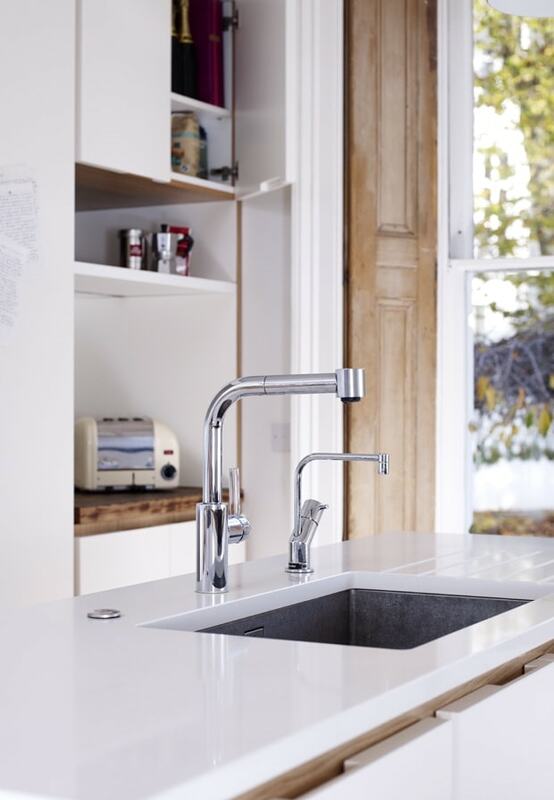 The sink is extra large so that plates can be piled into it and not left out on the island worktop. Aside from the Mercury cooker, the kitchen is also equipped with a Gaggenau fridge, Miele fully integrated dishwasher and a Quooker. The cabinets flow through from the kitchen into the dining/living area to create a link between the two zones. There is plenty of deep drawer space for storage. Integrating existing appliances into a new design. 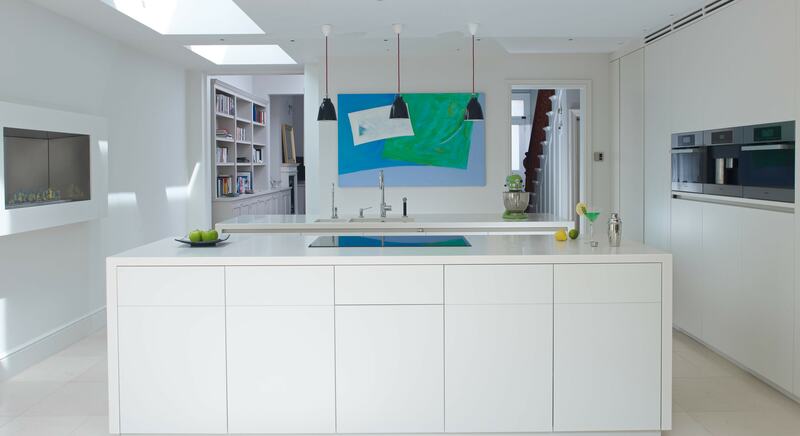 Designed within a West London terraced home, this bespoke kitchen design met the brief of our client who wanted an open-plan, minimalist and sun-filled kitchen and dining space within their new extension. Due to the size of the new space, two stunning island units that are clad in Corian Bisque – one island has a sociable side for bar stools, which also features a double sink preparation area, and the other island features a Miele hob with a ceiling-mounted exactor so our client can enjoy the garden space view whilst they cook and entertain. 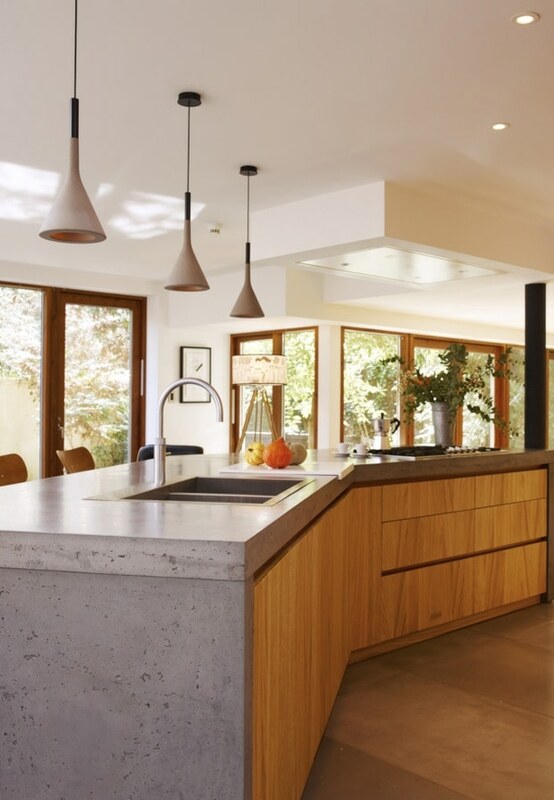 Walnut cutlery trays provide contrast and definition to the island units whilst hanging black Caravaggio pendant lights provide effective task lighting as well as a splash of colour. 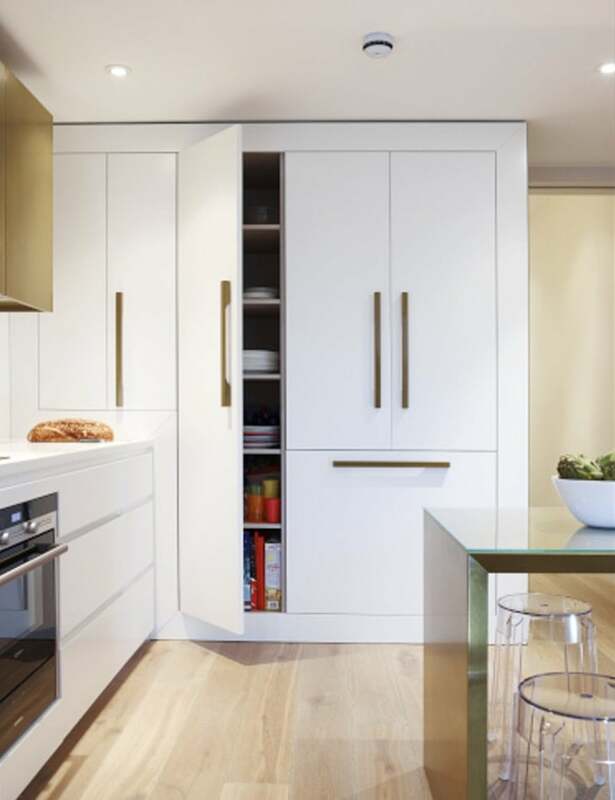 The contemporary and minimal cabinet design is complimented by a range of sleek Miele appliances, arranged side-by-side within a wall of flush-fitted tall handle less cabinets, and centered on the islands. All other appliances are integrated and hidden behind doors which were spray lacquered in a colour to match the island worktops. 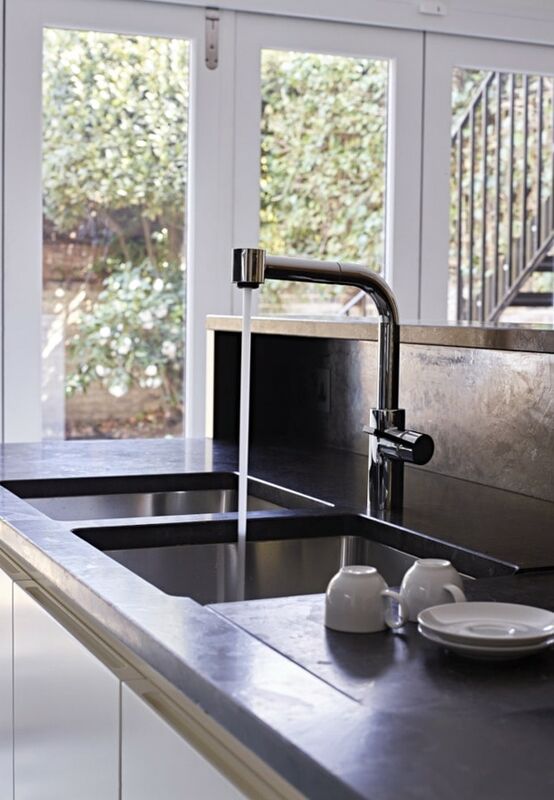 Dornbracht taps with matching hot water tap, and soap dispenser were selected to remove any temptation to leave a kettle and soap on the island. 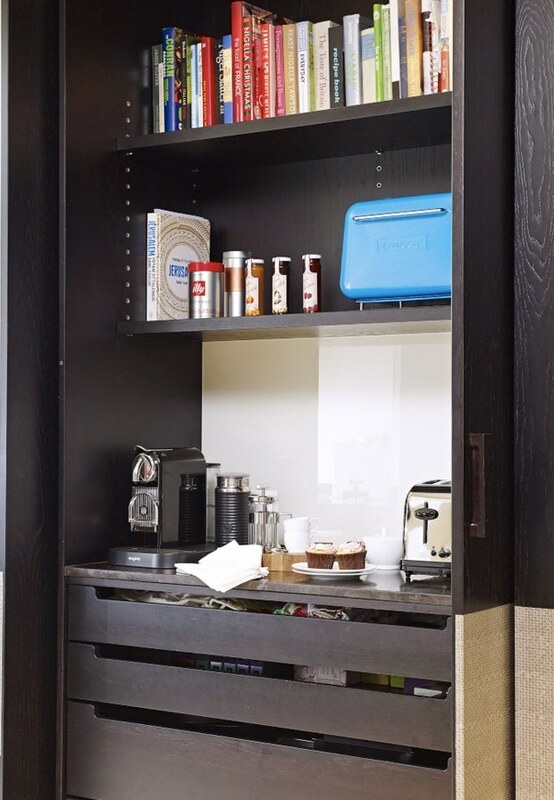 The larder cupboard includes provision for a toaster on a pull out shelf, so that it can be used and then pushed out of site, without the need to lift it. An EcoSmart fire was installed into the wall directly opposite the cooking appliances, in order to add interest, balance and warmth to the kitchen area. The transition from sprayed kitchen cabinets into a walnut media cabinet helps to define the dining space and provides housing for the TV and related equipment. With the sliding folding rear doors fully opened, the dining area appears to extend into the garden, and creates the perfect space for entertaining family and friends. 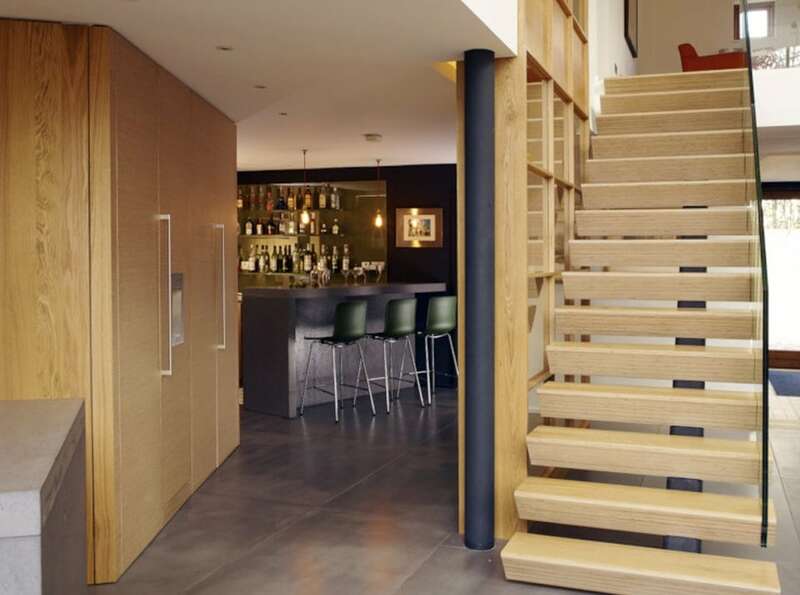 Typically the challenge is to consider how to best use or adapt a finite space, usually along a wall elevation. With this internal renovation of a 18 year old modern new build with aa wealth of open plan space, we had few limits yet no such obvious placement. The clients were also keen to add warmth a more welcoming intimacy to a previously brash and clinical space. 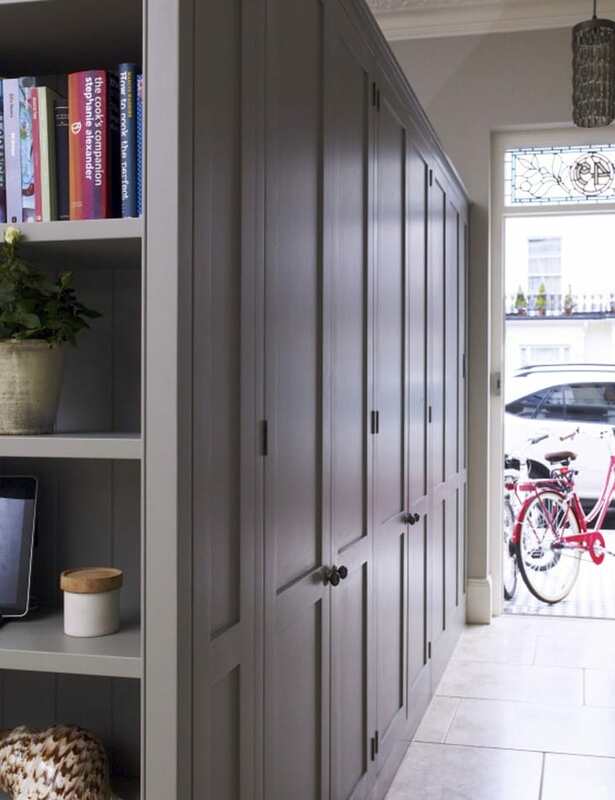 The bespoke floor to ceiling cabinets wrap around a concealed utility room, and provide a wealth of hidden practicality. 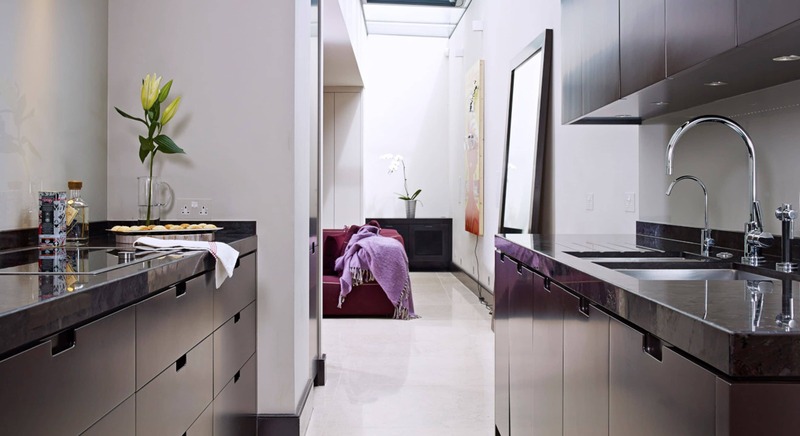 Double pocket doors conceal a further counter space with small appliances. 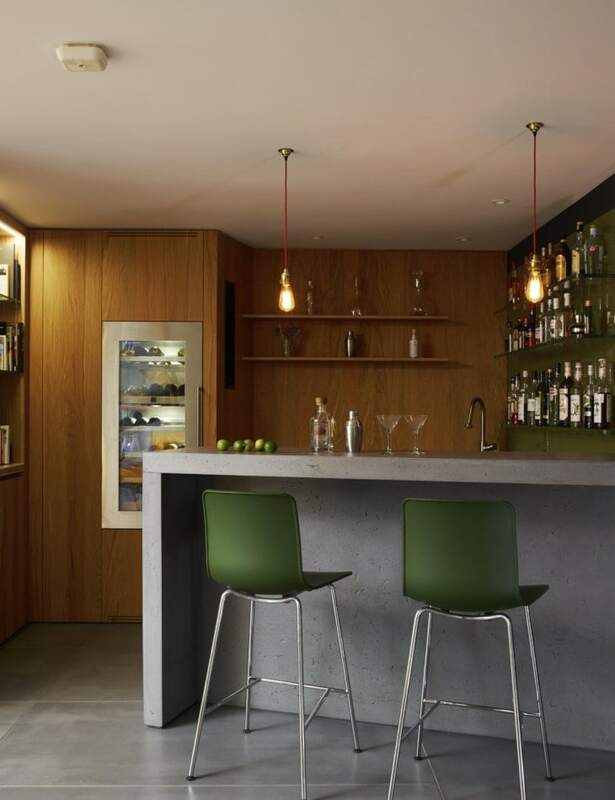 Separate large capacity Gaggenau fridge and freezer, and plenty of additional storage invisible behind wall of natural oiled oak, which continues around into a separate bar and drinks prep area. 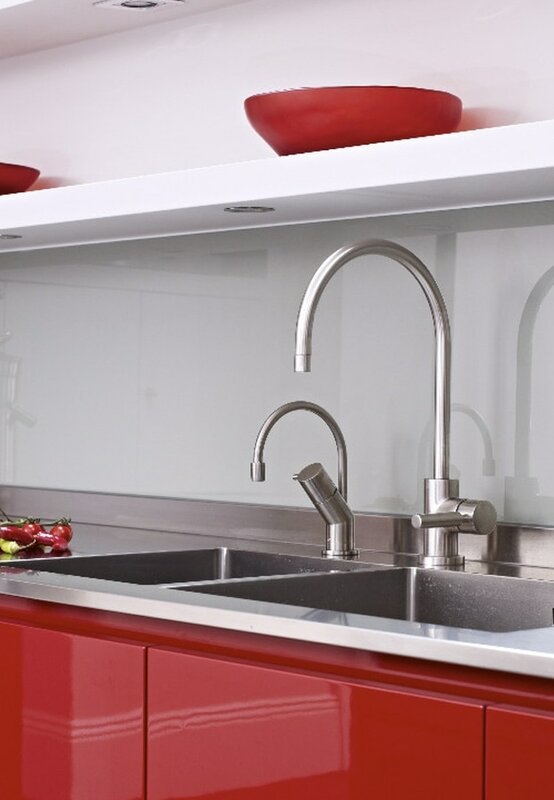 Simple functionality with prep space between sink and hob. 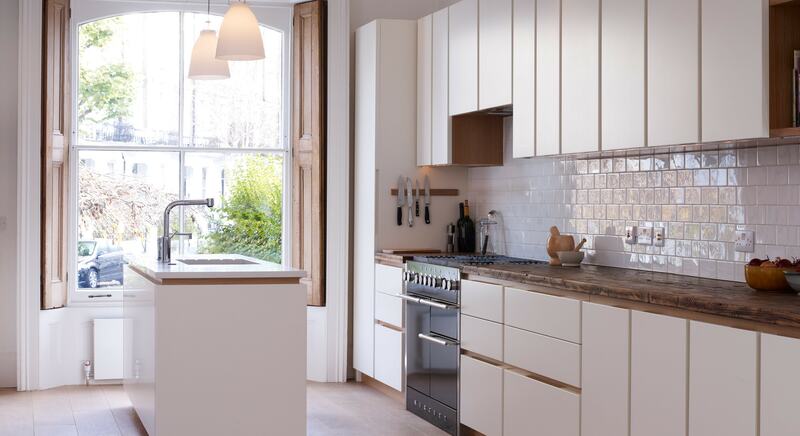 The owners of this South London terraced house wanted a modern kitchen with a slightly retro and Scandi feel. 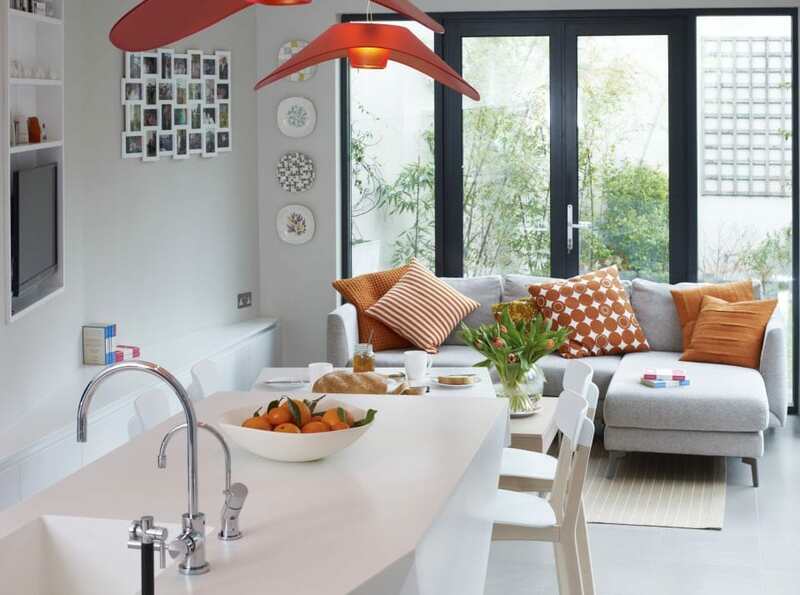 They wanted their existing conservatory to be replaced with an extension and open plan kitchen and diner which would become the heart of their home. The L shaped layout which includes a large island, breakfast bar and plenty of storage is ideal for a well functioning yet stylish kitchen. Our clients wanted to incorporate wood into the design, as well as a punch of colour alongside some darker tones. We wanted to choose materials and colours that would make the room welcoming. The oak niche in the storage unit allows the bright yellow exposed brick wall and hague blue unit to compliment each other beautifully, alongside the bespoke sprayed ply units. Contemporary kitchen in an old church building. 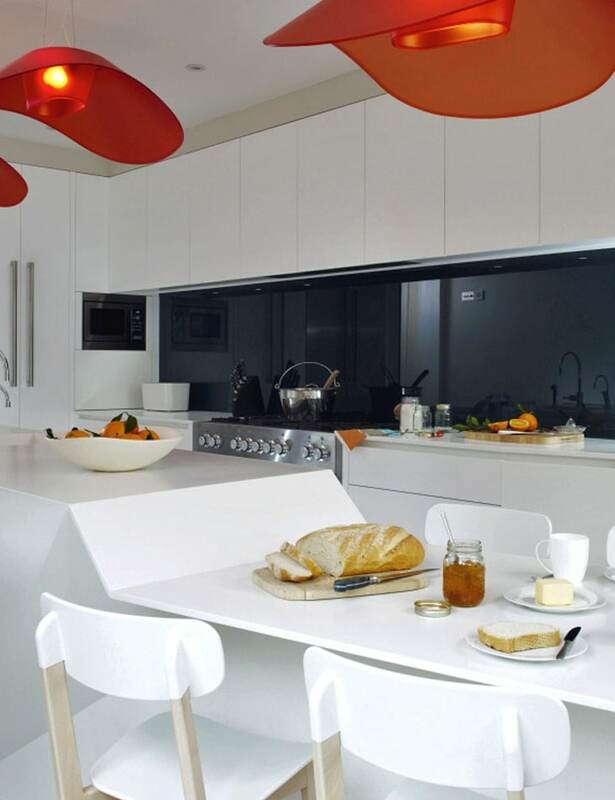 This kitchen was part of a large refurbishment of an old church into a residential family home in the middle of London. The clean lines of this minimalistic, contemporary style are in direct contrast to the original features of the architecture and create a stunning effect. 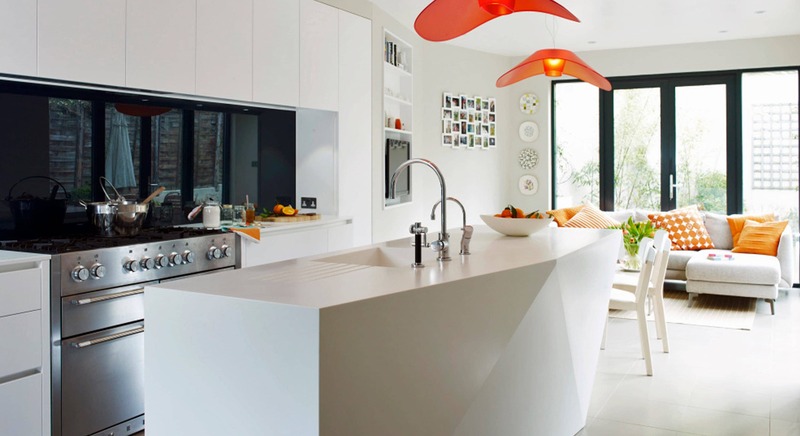 The key features of this bespoke kitchen design are the two 50mm-thick Corian framed island units that contained storage and pull out dishwashers. 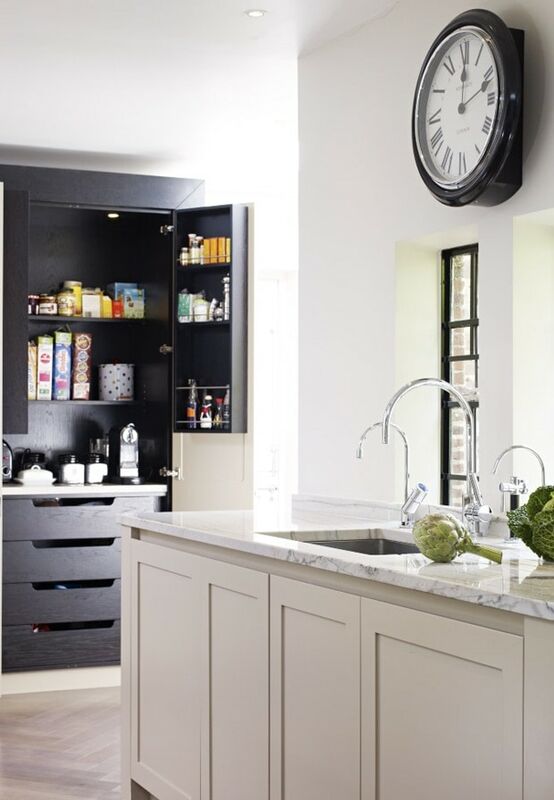 The storage wall features pull-out racks, further storage and a range of appliances which allowed for the worktops to remain uncluttered, maximising functionality. In addition to these benefits, the toaster was even set on a pull out shelf behind a door – with a fire retardant lining recessed into the shelf above. 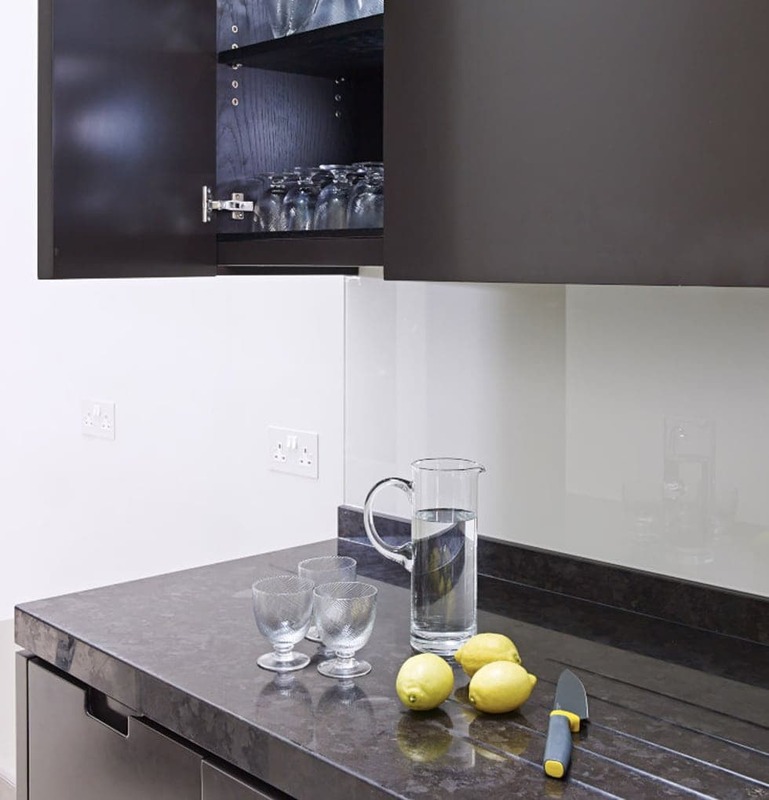 The use of the corian throughout enabled us to create details that added to the functionality such as the glass holders within one of the cabinets. Where outside and inside are in harmony. 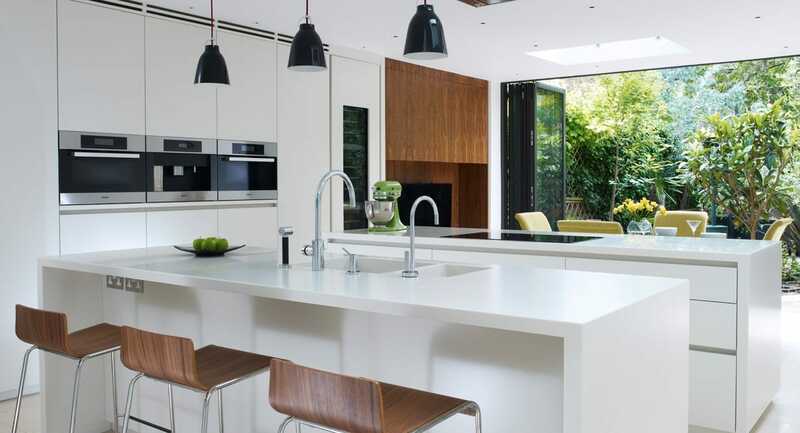 In this Chiswick project the garden played a major role in the design of this light , large kitchen, dining and living space. 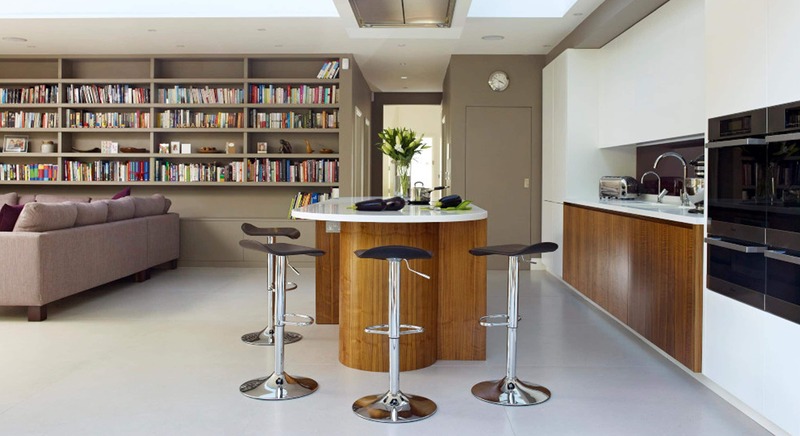 The oversized island was clad in book matched walnut veneer, to provide texture, warmth and contrast. 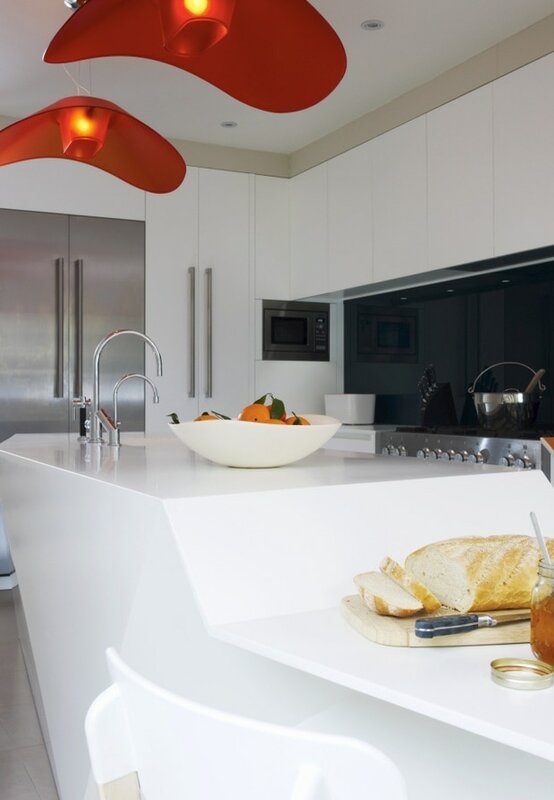 The wall cabinets were spray lacquered in a semi-matt white finish to match the 40mm thick ‘Glacier White’ Corian worktops. 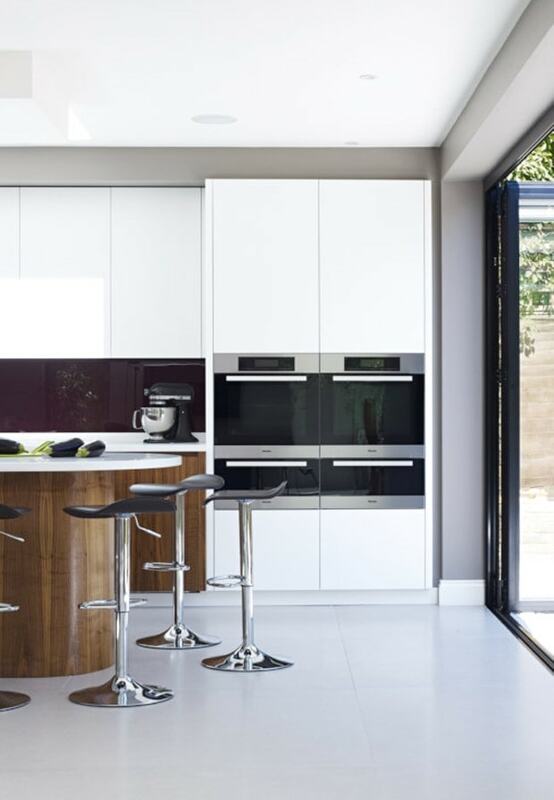 The tall cabinets were set back from the worktop slightly, to maximise the space available for the patio doors. The large curved storage drawers in the island were included on one end whilst a seating/ bar area was designed at the other end. Double Miele ovens and warming drawers were arranged symmetrically on one side with integrated Miele fridge freezer on the other. To provide contrast a painted glass splash back finished in Farrow & Ball ‘Brinjal’ was chosen. 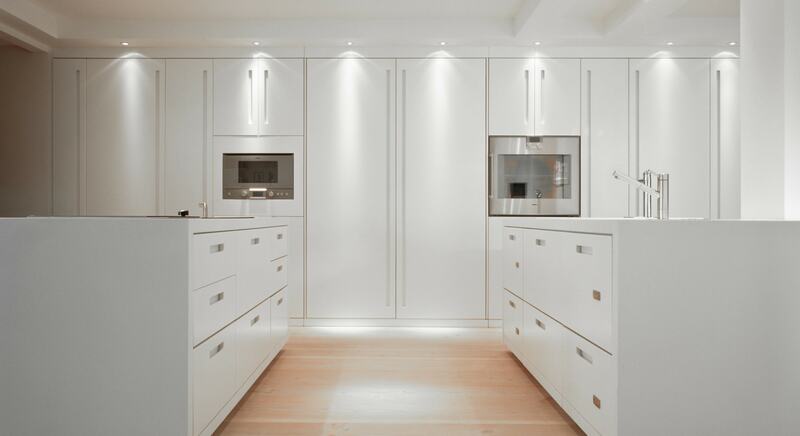 A walk-in pantry, with easy access to the fridge freezers was included in the design for additional storage. 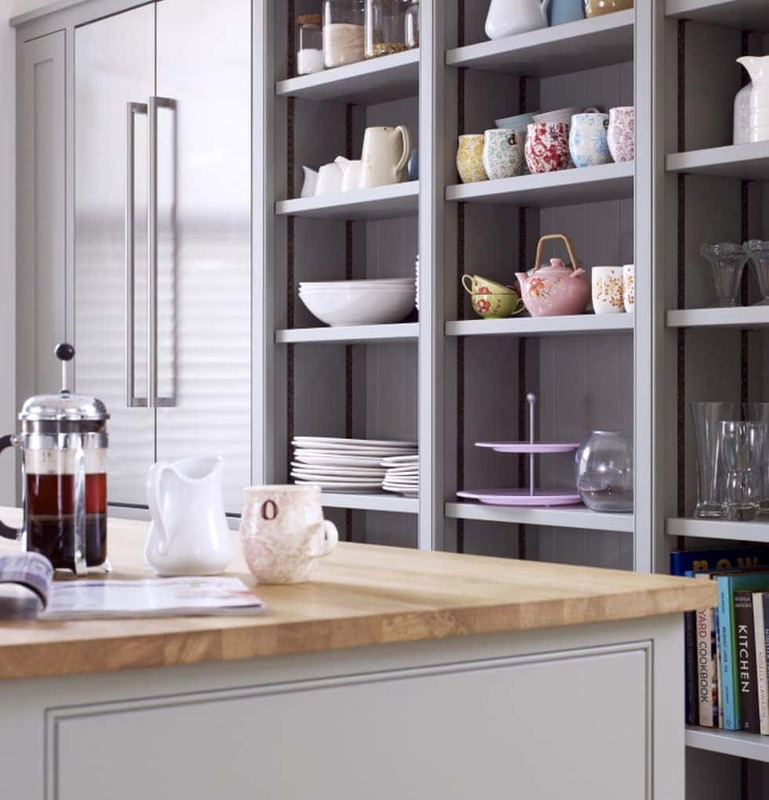 We also designed and manufactured the built-in shelving that adds character to the living area, which were hand-painted and finished in Farrow & Ball’s Elephant’s Breath eggshell paint. A keen cook living in this family house in Surrey prefers to prepare and serve food away from the gaze of guests. 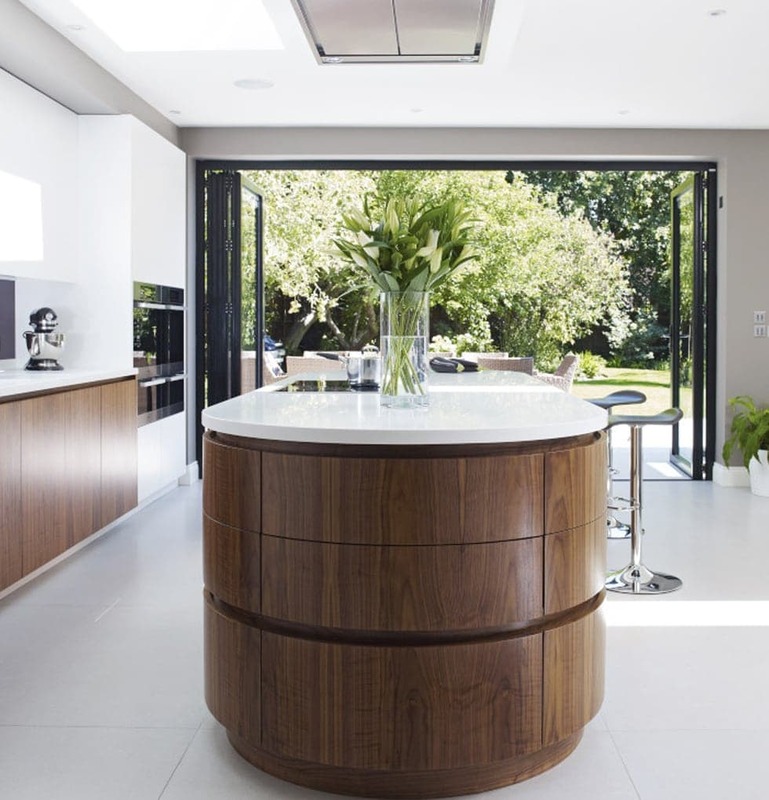 To achieve this a key feature in the kitchen is large sliding doors within the open plan space that have been inspired by a subtle Asian theme. 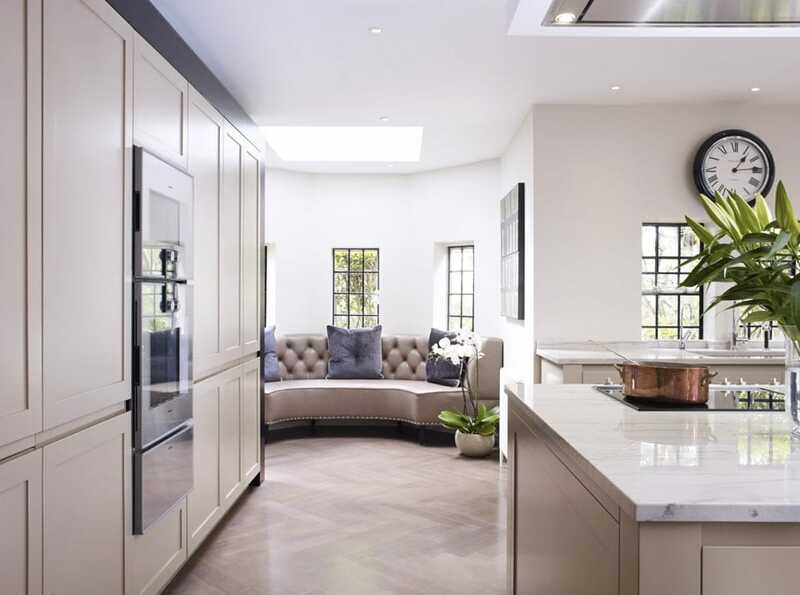 They create the effect of Asian style wall panelling that can completely hide the utility area and walk in larder but without blocking out light from the velux windows. 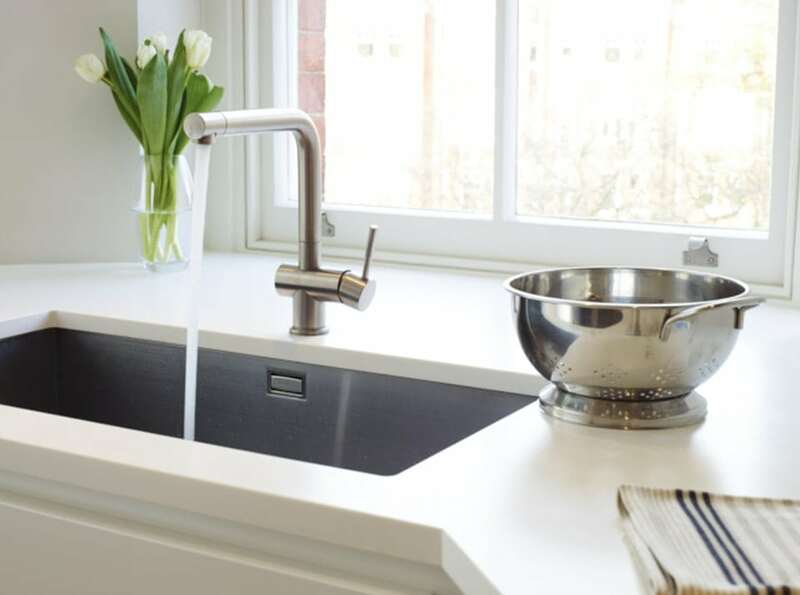 The utility and larder are equipped with two fully integrated dishwashers, large pull out bins, a waste disposal unit and a large stainless steel worktop with 2 large sinks. 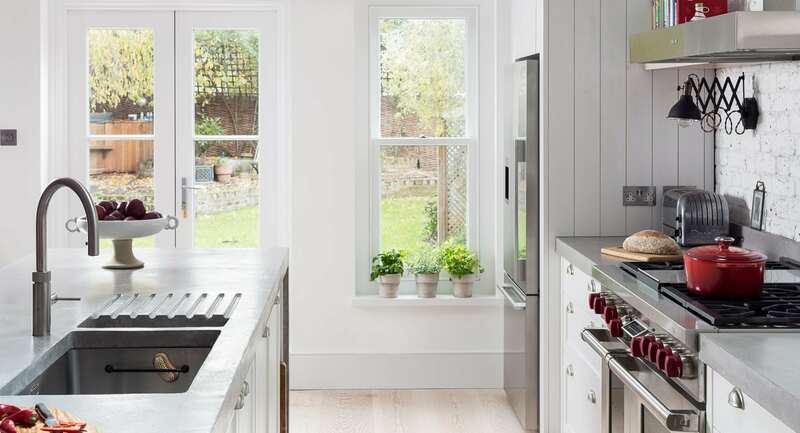 This is also the area where dirty pots, pans, bowls, plates and glasses can be stacked up and left for later without the worry of the worktops in the main kitchen becoming cluttered. 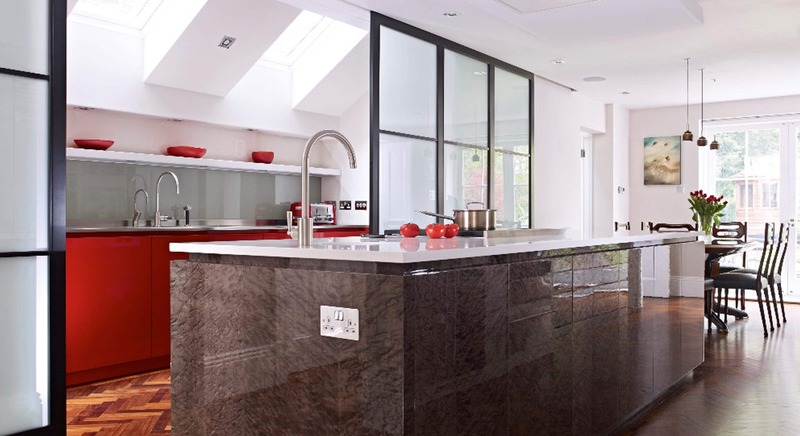 The main kitchen island is made of a beautiful rich stained burr maple veneer and to keep to the subtle Asian theme the rest of the joinery has been finished in a red lacquered paint. 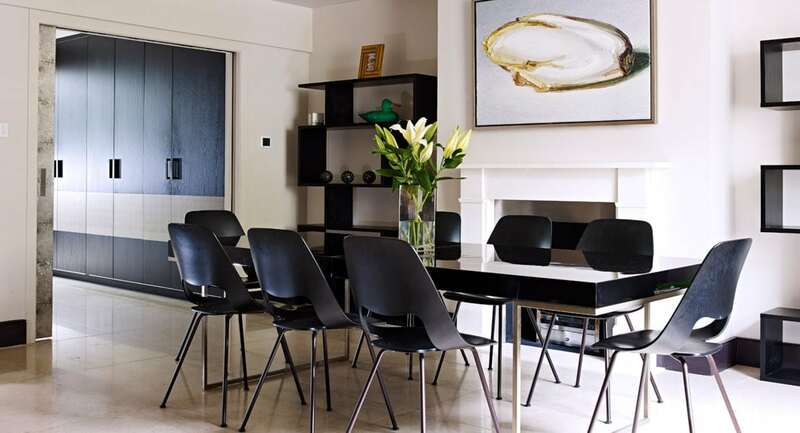 Our clients bought this Kensington flat with the hope of transforming it into contemporary and glamorous space that would also be child friendly. 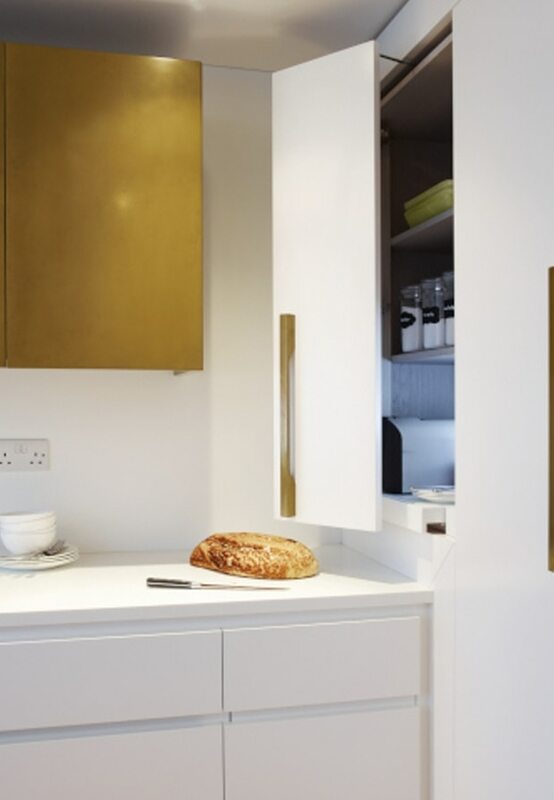 The bespoke cabinets were hand sprayed in our workshop, and we worked hard to ensure that the metallic finish was exactly what the client wanted, complimented with neutral tones on the walls and units to ensure the look was more subtle. 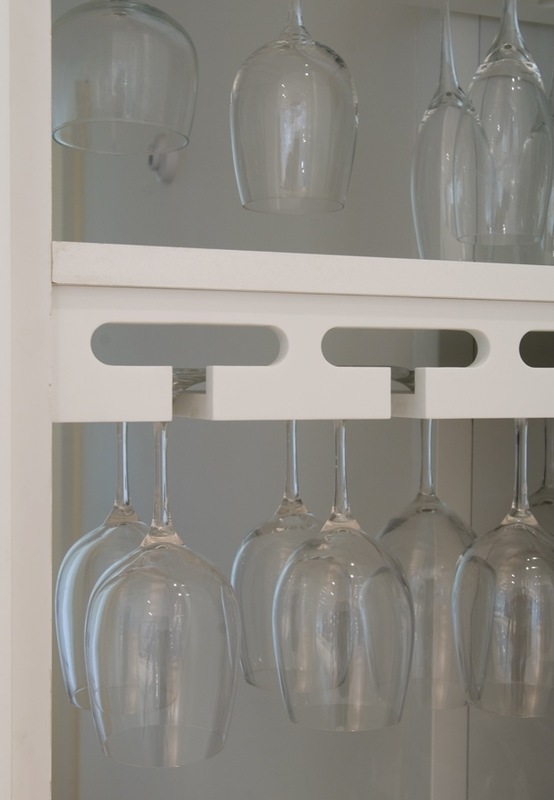 A central focus of the kitchen is the display cabinet for glasses. This was designed with an antique mirror to back it which is lit from behind. 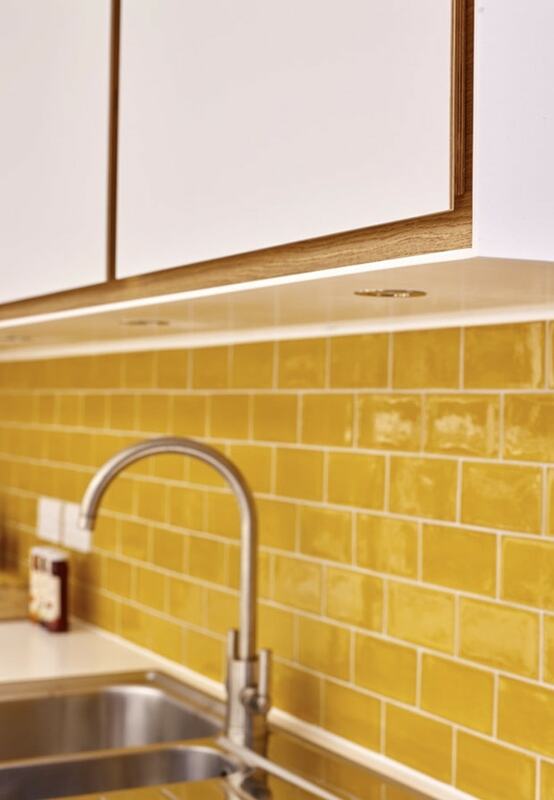 While these aspects give the kitchen a sleek feel, we also had to ensure practicality. 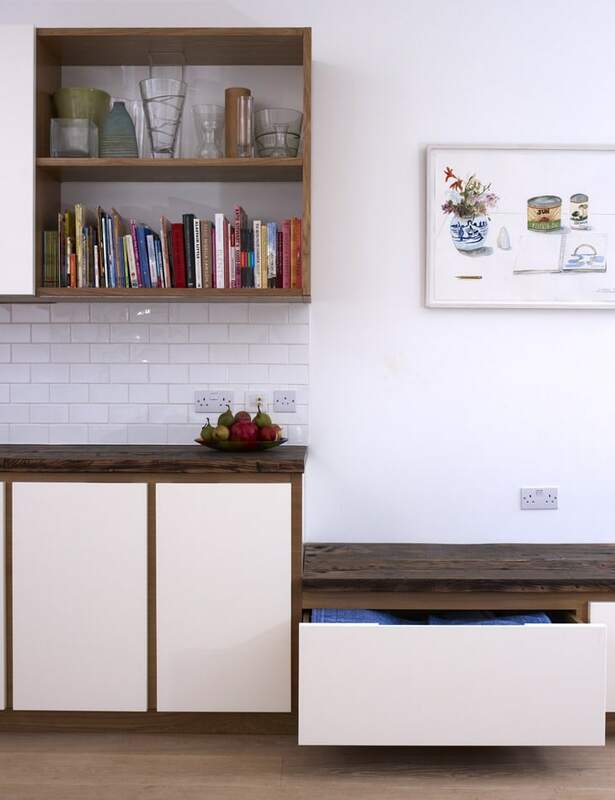 The storage spaces mean the kitchen can easily be kept tidy and clean, which is an important consideration when designing a space for a family with young kids. 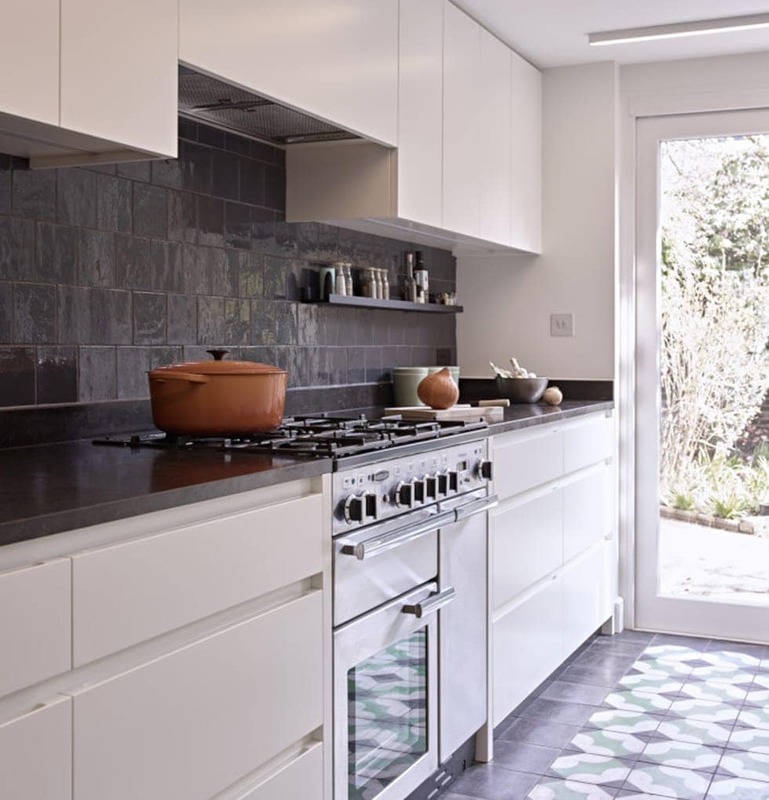 We were commissioned to design a clean lined, contemporary kitchen space with a retro edge for the owners of this west London Home who loved entertaining and cooking. 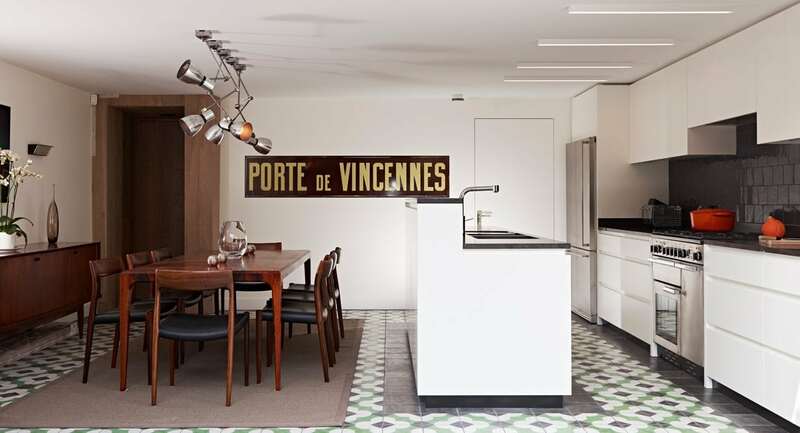 The existing space had retro style colourful floor tiles covering the entire floor and so we began by designing cabinetry that would emphasis and compliment the floor tiles and but also offer a degree of separation between the kitchen and dining room. The cabinets are finished in Farrow and Ball Wimbourne white in a semi matt lacquer to give a simple and practical fee. 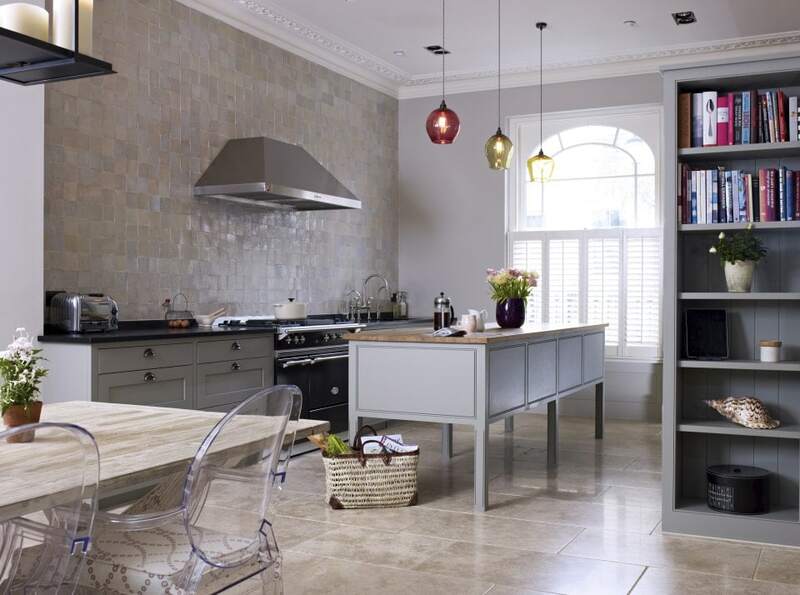 The scallop detail on the cabinetry helps to enhance the quirky and retro design of the space. The plinth on the island is painted black to visually connect the unit and the floor tiles. The raised counter on the island was designed to conceal mess and crockery from the dining table and doubles as a bar area when entertaining. The Antique Brown honed granite worktop was chosen for its practical properties as it’s easy to clean, virtually stain resistant and is very hard wearing. The skin touch granite also provides a depth of material contrast to the cabinetry and wall tiles behind the Rangemaster cooker which all lines up beautifully with the chalk tones in the floor tiles. Contemporary artwork finishes the overall look of the room to create a quirky yet chic space. Light floods into basement Kitchen. 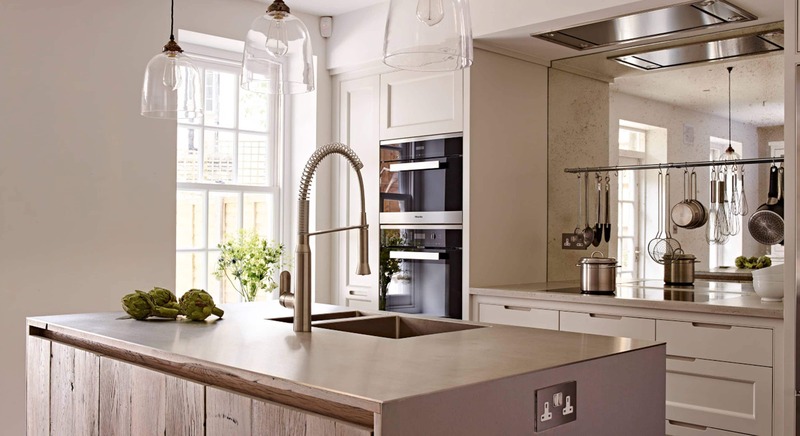 We were asked to create a highly functional yet stylish kitchen for the owners of this London family house in Holland Park. 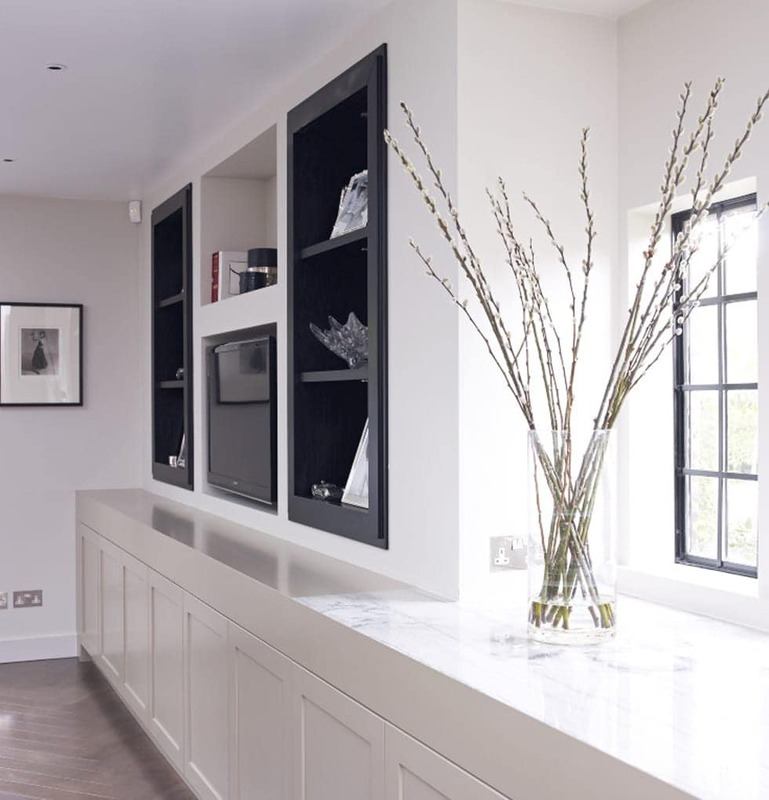 The original room was narrow and had differing glass ceiling heights, so we really had to consider how best to use this space in order to design an ideal kitchen for our client. It was important that the design would allow for socialising and entertaining, as this was a key part of our brief. 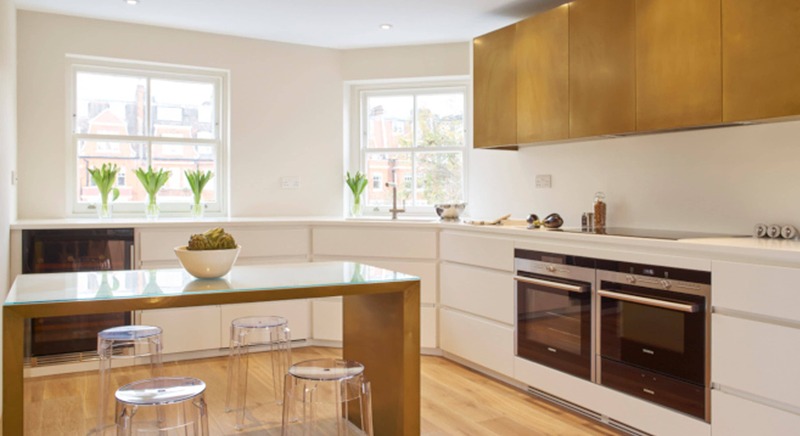 Oversized bespoke cabinets and leather cohiba worktops were fitted alongside integrated Gaggenau appliances to create a galley style kitchen plan that was ideal for both a ‘working’ and ‘entertaining’ zone. To address the brief, we also designed a cabinet dedicated to drinks. This featured dark-stained oak doors to compliment the leather inlay and bespoke handles. The brief was to fit a kitchen, dining and living in to a fairly limited space. The solution required a keen focus on ergonomics to make this possible, with the table becoming an extension of the island. The island-table is formed by fusing 26 Corian facets into one seamless structure that steps organically from worktop to table. The step in height still allows for a clear demarcation of space. 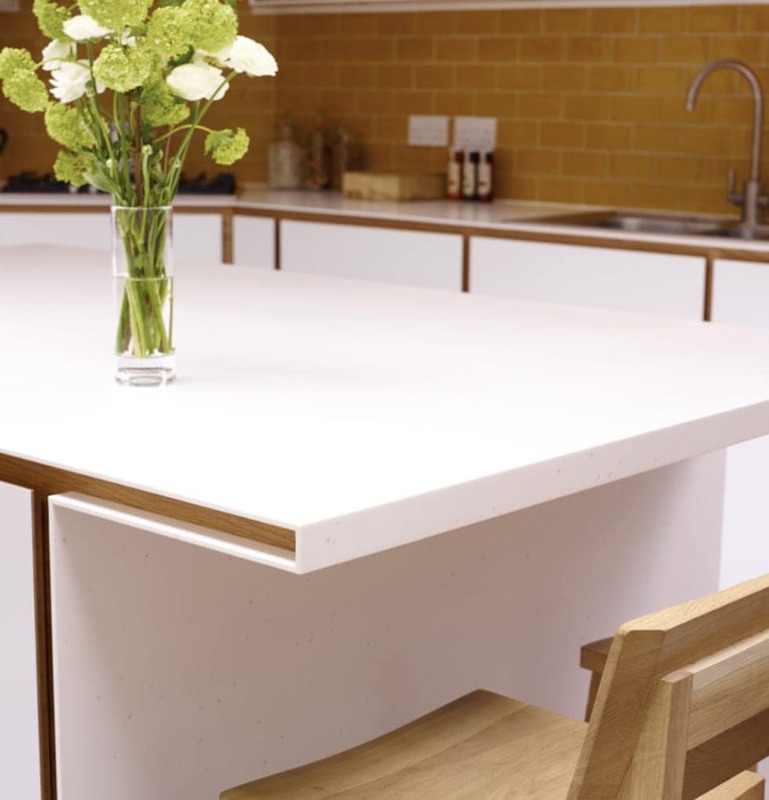 The remaining bespoke cabinetry was spray lacquered to match the colour and semi-matt finish of the glacier white Corian to achieve complete seamlessness. Discrete low level cabinetry also runs across into the living space. 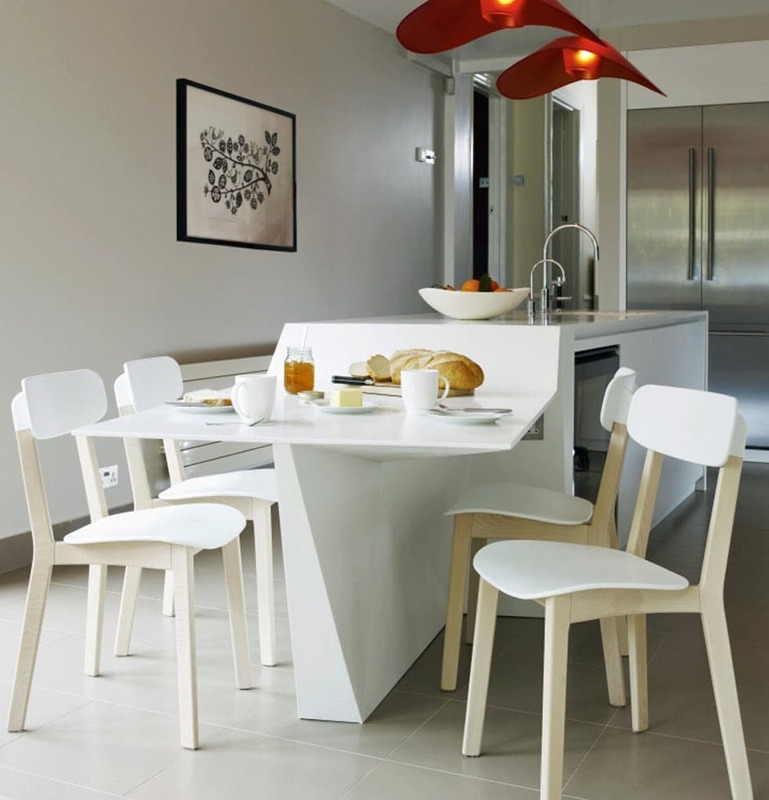 The result is a functional yet organic space that enhances family living. Island steps seamlessly to table. An eclectic mix of materials and features. 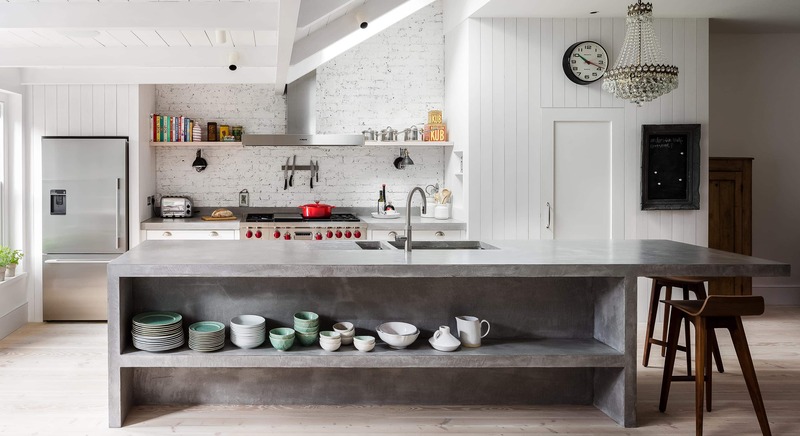 The brief for this end of terraced West London home originally built in 1935 was to create something that didn’t look like a fitted kitchen and in an eclectic mix of materials and finishes. 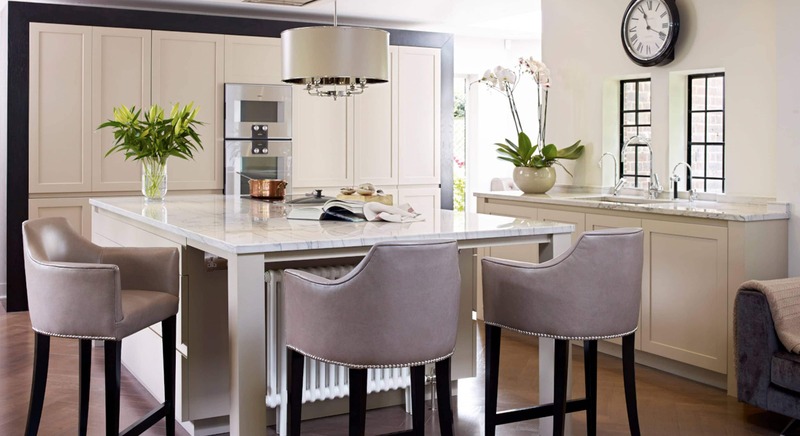 As a keen cook the kitchen needed to be functional and work well alongside a dining area for the large amount of entertaining that was an important part of how the space would be used. 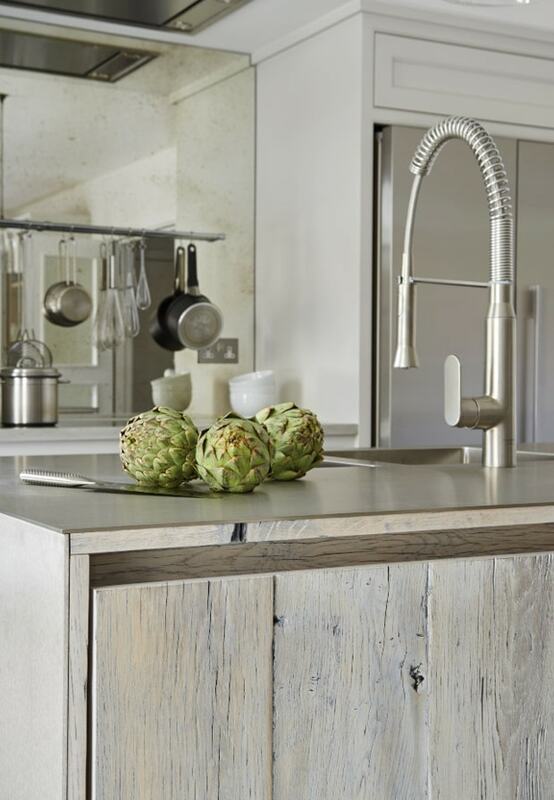 The island is made from reclaimed oak floor boards that were salvaged from a Belgium Chateau and were then sanded down and stained to soften them and to make the tone sit well with the stainless steel worktop. 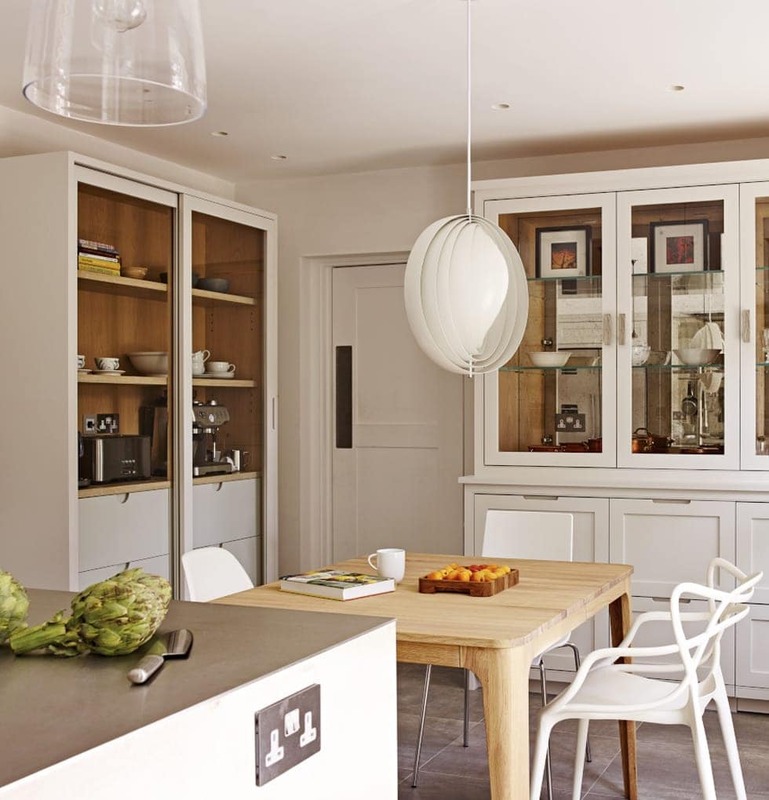 The free standing shaker style dresser in the dining room area of the space provides a place for displaying crockery. The dresser also conceals a built in dishwasher making it easy to clear the table after dinner parties. 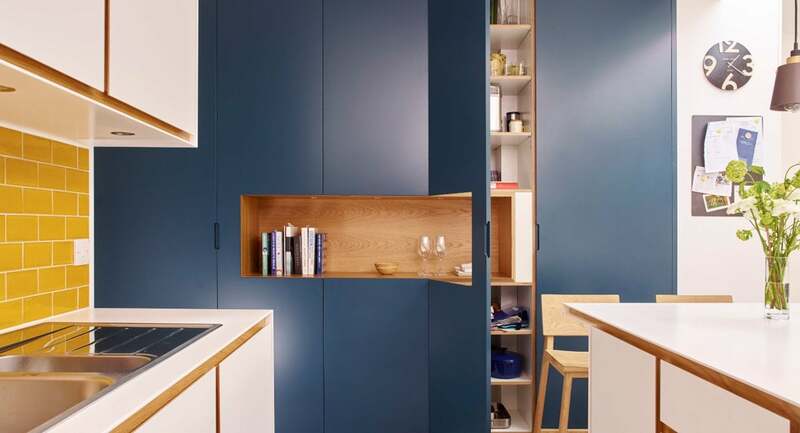 The freestanding corner unit is used for breakfast items like coffee machine, toaster and cereals and allows this area to be separate when cooking is being done in the main kitchen. 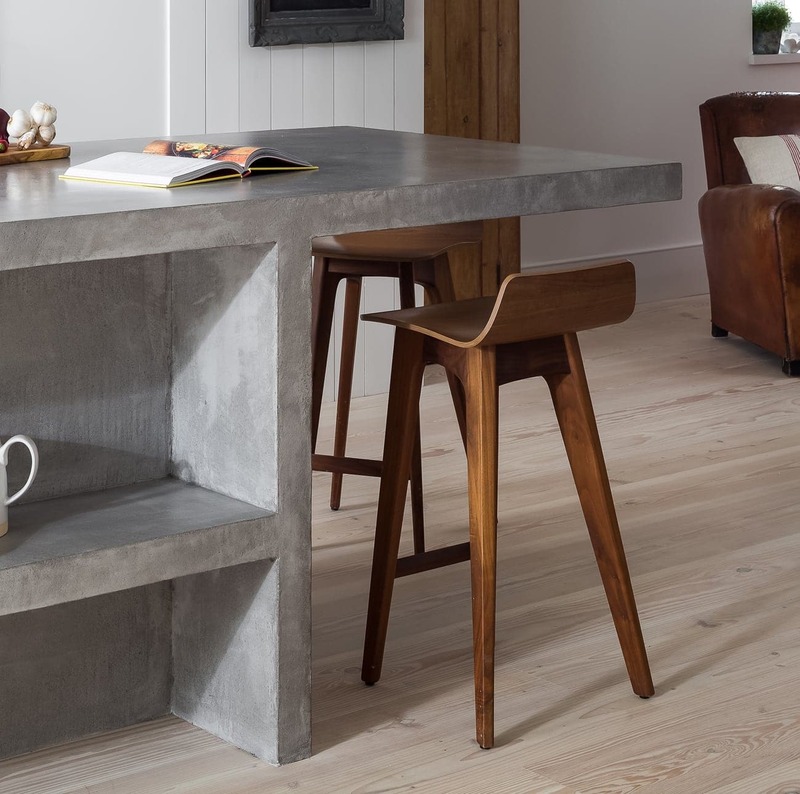 Resin sealed concrete has been used for the oven elevation and completes the contemporary industrial feel to the kitchen. The antique splashback mirror helps to make the room even lighter and more spacious. Free standing dresser discreetly houses the dishwasher. 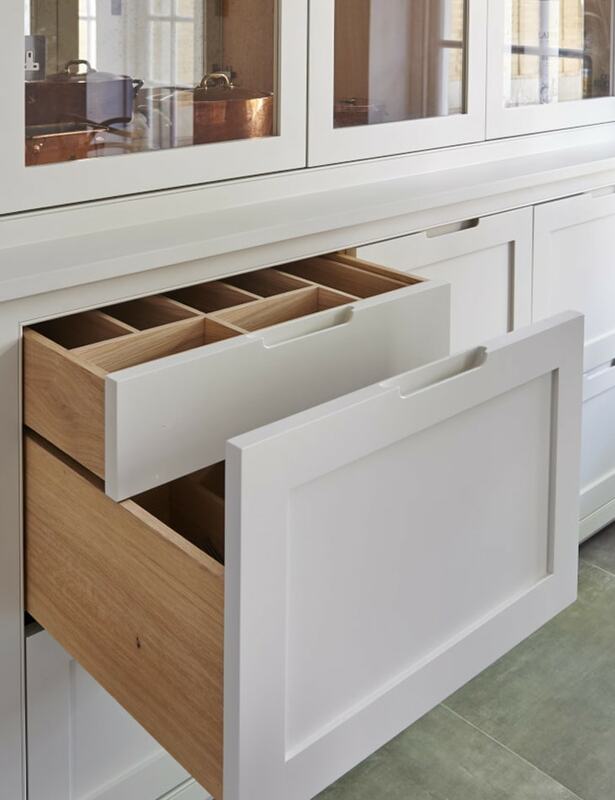 Hidden drawers to maximise storage.